Webinar marketing is a favourite strategy for B2B brands looking to build a stronger relationship with their audience. Aside from capturing new leads, webinar marketing can help you gauge how qualified your prospects are and nurture them along the buying process – even if they don’t convert directly after watching. In this extended guide, we’ve got just about every tips you could ever need to build a webinar marketing strategy that drives more signups, gets people attending your webinars in larger numbers and increases sales as a result. That’s quite a lot of tips for us to get through – so let’s get started! As with any marketing strategy, content is the first thing you need to think about. So let’s begin by looking at how you can create webinar content that gets results. The webinar itself is only one part of a much larger strategy. It’s important you know what role your webinars are going to play in this – especially if you’re going to publish multiple webinars with different marketing objectives. One of your webinars might be designed to raise awareness about a new product, for example. While a later event could be designed to push sales more directly. Be strategic, plan well in advance and have clear goals for every webinar you publish. 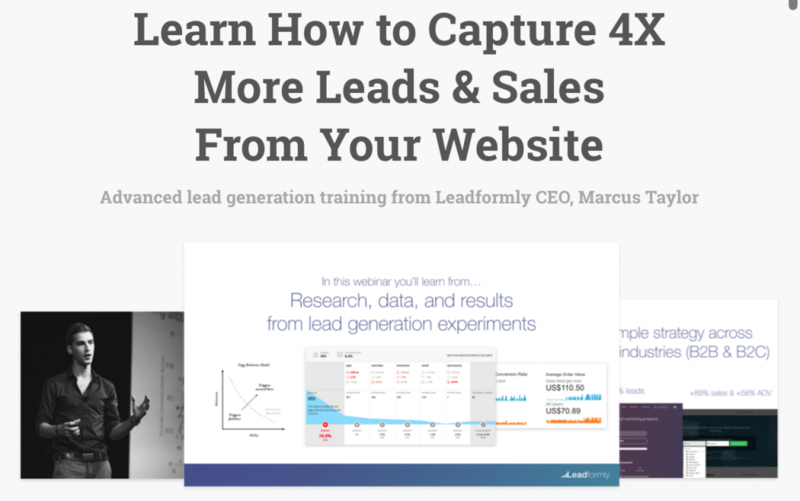 Our prerecorded webinar on How to Capture 4X More Leads & Sales From Your Website gets results every month. Most webinars are live events streamed online and then later recorded for attendees to download afterwards. However, this isn’t the only way you can go about things. You can prerecord your webinars and upload them for viewers to watch anytime, anywhere. This allows you to create evergreen webinar content that continues to generate new leads on a monthly basis. We’ll be talking more about prerecorded webinars throughout this guide. One way to keep your webinar audience engaged is to create a series of webinars for them to follow. This can work well for a SaaS companies, for example, that need to keep people signed up to their software platforms. Your webinar marketing goal, in this case, could be to retain customers and potentially upsell them to a more expensive payment plan. The most important thing in terms of webinar content is that you address your audience’s concerns. Whether it’s creating a more productive workplace, cutting business expenses or getting more from their advertising budget, your webinars need to address these issues. Otherwise, people have got no reason to sign up, let alone watch. Your target audience is already bombarded with ads and invitations to sign up for webinars. We’re approaching a point of webinar fatigue where people only pay attention to the most promising webinars. You already know what your audience concerns are so now you need to promise something special. Tell them you’re going to transform their business into a more productive place, slash their expenses and reveal the advertising secrets they’ve been waiting for. When it comes to communicating this grand promise in your webinar title, use numbers and power words to grab people’s attention. You’re not just going to increase productivity, you’re going to boost it by up to 300%. Throughout your webinar, provide actionable tips that attendees can put into action as soon as they’ve finished watching. This will confirm your webinar has value and keep them watching until the end. Throughout your webinar marketing strategy you want a consistent brand voice to shine through. Define this before you get started because this is part of what keeps people coming back to view more webinars. Each of your webinars is a short story of the brand experience for your target audience. You need to engage viewers with a compelling story and it takes professional storytellers to pull this off. I see too many CEOs take to the stage at live events, only to prove they’re not really cut out for public speaking. Not everyone needs to be a great public speaker, there’s nothing wrong with that. But whoever you choose to host your webinars does need to capture your message and brand voice in a compelling way. Expert speakers add authority to your webinar and encourage more people to sign up and attend. Authority is important because it makes your webinar and the points you make more credible – especially when you’re just starting out. Engagement is always important when you expect people to keep watching for 30 minutes or an hour. Allow viewers to ask questions, make sure you answer them, ask questions in return and conduct polls or surveys in your webinar to keep people involved and engaged. Multimedia content is another key tool for keeping people engaged. Include video clips, slides, images, on-screen text and other visuals to create a more engaging experience. There’s a limit to how much visual content people can read at once. Keep in mind the fact that people need to understand what you’re saying and take in any visual content that pops up throughout your webinar. Remember that your audience is being bombarded with webinar invitations and plenty of these are going to be coming from your competitors. Sign up and watch your rivals’ webinars, carefully examine how they market them and aim to beat them across the board. There’s nothing wrong with promoting your products or services in a webinar but don’t be too aggressive. Remember the point here is to address user concerns and get them involved with your brand. Running webinars can be incredibly cheap or surprisingly expensive. Decide what your audience needs in advance and don’t make compromises. There’s no point doing this if you’re going to scrimp on the necessary tech gear or content quality it takes to get results. It’s better to create fewer high-quality webinars than a catalogue of sub-par content. How you run your webinars depends on what kind of production you want to host. In some cases, a live video chat allowing people to speak to your technical staff might be all it takes. Other times, a full studio session with a production team and a live audience might be the way to go. Whichever approach you take, there are some things you’ll want to do for every kind of webinar. Whether you’re hosting a live event or not, record your webinars. Allow users to download them after they’ve finished watching, send links to people who didn’t attend and use clips to attract new viewers on social media. Once you start recording your webinars, you’re able to plan out an automated strategy where you can promote them all year round. We use a tool called Everwebinar to automate our own webinar strategy and our results have dramatically improved since automating things. Whether you’re doing the webcam thing or hiring a full production team, make sure you get the right tech gear on board. At the very least you’ll need a platform for streaming/recording your webinar and the right sound gear to make sure everyone can hear you. For more ambitious productions, you could need a full suite of professional tech and software. For live events, make sure you test all of your gear before hitting the play button. You need to reduce the risk of technical issues as much as possible. So, even if you’ve been using the same gear for years, test your setup before every live event. This is especially true you’re using multiple cameras, live editing, sound gear and technical staff. Your speakers will certainly want to rehearse before going live. But, if you’ve got any kind of production team involved, do full rehearsals so everyone can get any mistakes out of their system. Even if you’re taking the webcam approach, have a people on board to address any technical issues that might crop up. You don’t want to be fiddling with mics or presentation gear in front of your audience. Have people on standby to handle any mishaps so you can keep your audience engaged, should anything go wrong. No matter how much you rehearse or how large your technical team is, something out of your control can still go wrong. You need to expect this, have contingency plans in place and be prepared to deal with any issues. From backup mics to prerecorded footage you can cut to in times of need, make sure you’re prepared. If you’re going to automate your webinars, you need to avoid making certain time references – or at least edit them out in the post-production stage. You don’t want to reference the 2018 World Cup when people are watching your webinar in March 2019, for example. I mentioned Q&As as a way to engage your viewers earlier but you might be wondering how on Earth you’re supposed to do this with prerecorded webinars. Well, luckily, Everwebinar comes with a live chat simulator that allows viewers to ask questions and get genuine responses, no matter when they watch. When you invite people to ask questions, be prepared to answer them. Don’t deflect questions like a politician or crumble under the pressure of being asked something you didn’t expect. Live or not, you’ll need someone to handle the Q&A process with your webinars. However, for live events, you’ll want moderators who are able to approve and manage the conversation. You’re not limited to one CTA in your webinars but make sure you at least end with one. This doesn’t necessarily have to be the main CTA for your webinar but it should prompt them with the desired next step to take after watching your webinar. Try to end your webinar with a sense of urgency that encourages your attendees to take action now, rather than later on. The chances of people taking action later reduce significantly so try to create that sense of urgency while you can. One of the key aspects that made us choose EverWebinar to automate our webinar strategy is that it comes with a number of features to recreate the live experience with recorded webinars. 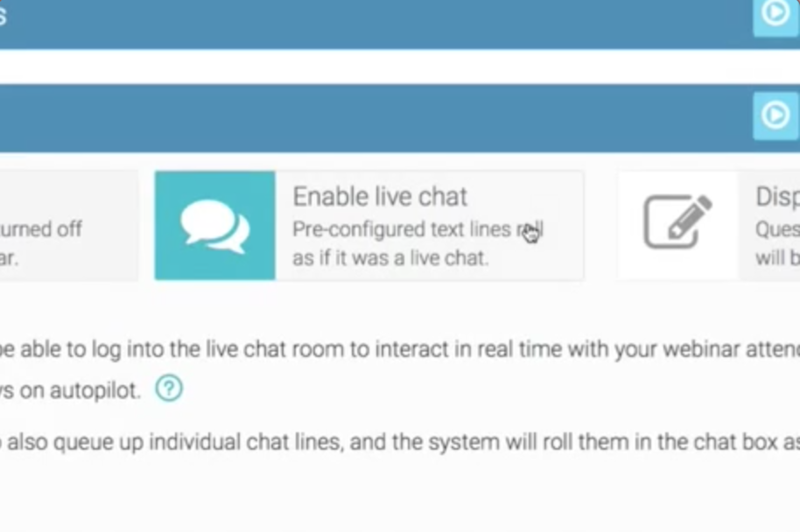 Aside from the live chat simulator, users joining your recording after it starts playing to simulate the live streaming. There’s no play or pause button involved here. With your webinar recorded or ready to stream live, it’s time to think about how you’re going to promote it. So let’s turn out attention to drumming up interest in your webinar. The first thing you’ll need is a dedicated landing page for every webinar. Essentially, this is your registration page and also the place you’ll point to with your ads and CTAs elsewhere on your site. Hopefully, this one’s obvious but it would be a crime to leave it out. Unless, this is your first webinar reach out to people who have attended your previous events and get them signed up to the next one. AdWords is a great place to promote your webinar. Target long-tail keywords related to the audience concerns you’re addressing in your webinar – eg: “How to improve productivity in the workplace”. Facebook is another great place to promote your webinar and you might want to think about LinkedIn, Twitter and other platforms too. The great thing about Facebook is you’re able to target people with incredible detail. Use this to your advantage. Your email list should be one of the first places you think to promote your webinar. But consider how you’re going to segment your audiences, personalise your messaging and how regularly you’re going to remind people. Another place to promote your webinar is on blog posts related to the topic you’ll be covering. What you can start to do is create blog posts specifically related to the same topics and leave readers wanting more. Point them in the direction of your webinar as the place to get the conclusion they’re looking for. Exit-intent popups are always a contentious issue so this is something you’ll have to weigh up yourself. It’s a method worth considering, though, as they’re less intrusive than traditional popups. A great way to expand your webinar reach is to create partnerships with brands that have a valuable audience. You don’t want to team up with direct competitors, of course, but you can link up with brands that have a similar target audience. Ask yourself, which other brands are these kinds of people engaging with. To expand the reach of your webinar audience, source out relevant third-party sites and publish guest posts there. The larger their audience is, the greater your chances of attracting new registrants for your webinar. Publish articles on LinkedIn to promote your webinar. Don’t make it too obvious that you’re goal is to get people signed up; create a solid article in its own right and lead to your webinar as a follow-up piece. LinkedIn owns SlideShare these days so this isn’t the most creative continuation on from our previous tip, admittedly. However, SlideShare users are already visually engaged in a topic and receptive to the idea of a webinar that has something to offer. Tap into this interest. When you tell people things are running out, their desire to grab what they can while it lasts increases. This is the principle of using scarcity to create a sense of urgency in people and you can use this with your webinars. Tell people there are limited seats which are rapidly getting booked to give them more incentive. This one works particularly well if you’ve got expert speakers lined up for a live event. Announce them gradually in the build-up to hosting your webinar and send out the necessary updates on social, email and your other key channels. Don’t be afraid to ask people who sign up to attend your webinar to invite other people who might be interested. Better yet, you can find a way to incentivise the process by entering them into a competition or offering some kind of bonus. Getting people to sign up for your webinar is only half of the battle. Now you have to turn those signups into people who actually watch your webinar, which is another challenge entirely. By carefully segmenting and targeting your webinar audiences, you’ll attract signups from people who are more likely to actually watch your webinar. Use targeting options on platforms like AdWords and Facebook to reach the right audience. 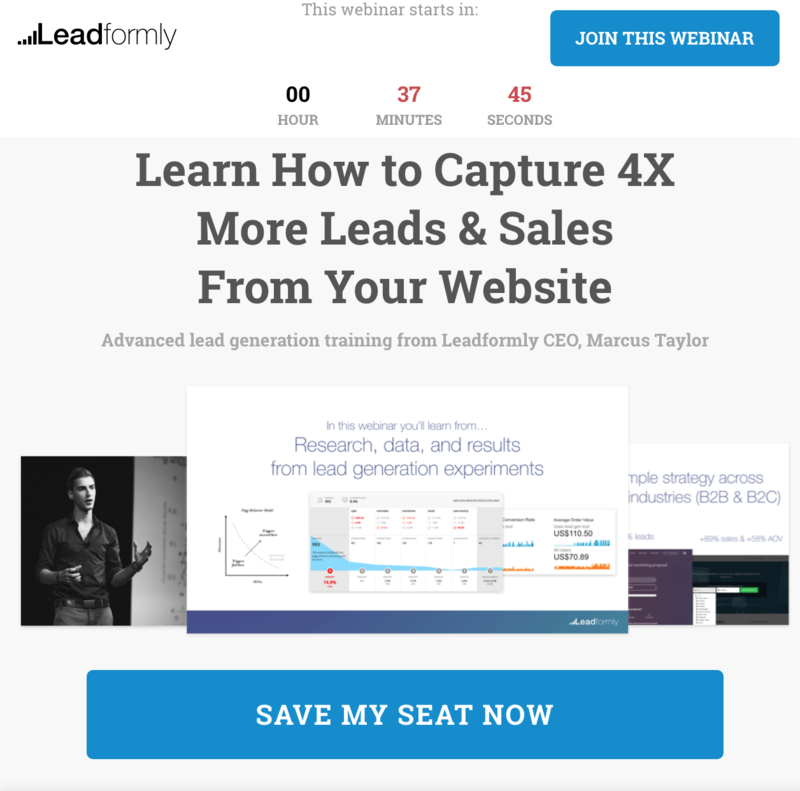 Just remember that you can still nurture signups who don’t attend your webinar as a different kind of lead. Your webinar landing pages are the gateway to getting people signed up, so take the time to optimise them for performance. You can find out how to do this by reading our 101 landing page optimisation tips article. A fundamental part of any webinar landing/registration page is the signup form – something else you’ll want to carefully optimise. Check out Leadformly‘s already-optimised web forms and analytics tools to help you optimise for better results. The first thing a thank you email does is confirm that users have successfully signed up to watch your webinar. But it also gives you the chance to get in there and push them for further action. For live webinars, you want to start sending reminders roughly two weeks before the main event. For prerecorded and automated webinars, sending reminders depends on whether people watch right away or schedule a viewing for another time. For anyone who misses their scheduled viewing, remind them that they can book another spot or watch right now. If you’re automating your strategy with EverWebinar this is another must-use feature. Just-In-Time Webinars allows people to watch your webinar almost on-demand. Set your webinar to play every hour and visitors are always just in time to catch the next show. The countdown clock creates a sense of urgency, encouraging people to sign up and watch right way. This is a huge feature. For live webinars, you’ll need to be strategic with your times and dates, considering where your audience is located and catering for any time differences. Automating your webinar strategy removes this problem, of course – and this is the best approach we have found so far. Email isn’t your only tool for reminding people about your webinar. Create AdWords remarketing ads to remind people as they browse the web and use Google platforms like YouTube. If people know they can watch your webinar whenever they want, the incentive decreases. So don’t advertise the fact that people can watch replays or attend your webinar on-demand. Maintain a sense of urgency and save the replays for those who don’t attend first time around. Another way to prevent people forgetting about your webinar is to provide an add-to-calendar button on your signup pages or in your confirmation emails. You can either code these yourself or embed something like Add to Calendar on your page. Simple but effective. As with any kind of video content, it’s important you also think about how to optimise your webinars for the best possible experience. People should be able to access your webinar from whichever device they choose. So make sure your webinars are optimised for mobile. If you use a third-party tool to host or market your webinars, make sure it supports mobile devices. Make sure you also compress your recorded webinar videos to reduce file sizes. This isn’t only important for mobile but also for loading times and moments where people are using weak internet connections. For embedding videos on web pages, use HTM5 video. Once again, this is important for mobile users (particularly cross-browser compatibility) but it also plays nicely with video formats and different encoding types (eg: subtitles). If you’re running a one-time live webinar, allow users to download the event in full for offline viewing. If you’re taking the automated approach, give users access to a page where your webinar is embedded, rather than allowing them to download it. You don’t want people uploading your webinar to YouTube while it’s still part of your lead generation strategy. Webinar length is important. You know your audience wants detailed information but you don’t want to go on for so long that they lose interest. Research generally suggests that webinars should be no longer than 60 minutes and somewhere between the 30-60min mark is a good place to aim for. Of course, you can ask your attendees whether they thought your webinar was too short, long enough or too long by getting feedback from them after the event. In fact, there are plenty of questions you can choose to ask and implement in your future webinars. This one is particularly important if you’re streaming live webinars. The further people are away from the server your video is hosted on, the longer it takes for your content to be delivered to them. A Content Delivery Network (CDN) speeds up this process by hosting your content on virtual servers in locations closer to your users. If you’re embedding a video player into any of your pages, be sure to define the height and width of your player. This saves the browser having to calculate the dimensions every time the page loads – a process that takes up valuable time. Sometimes it’s easier to revise text than skip through video, trying to find the key moments of your webinar. Transcripts also serve as good notes to send users after your webinar has finished, as part of your email marketing strategy. If you expect non-native English speakers to be attending your webinar, providing subtitles or captions can drastically improve the experience for them. Reading text another language at your own pace is one thing but listening to people speak at full pace is something else entirely. Providing subtitles/captions is obviously much easier once webinars are recorded but live subtitles are doable if you’re serious about targeting other language speakers. The whole point of your webinar marketing strategy is to generate leads, engage your audience and bring them closer to the sale. So let’s start looking at how you can nurture your webinar leads and turn them into customers. You’re not creating webinars for the sake of attracting viewers; you’re doing this to capture qualified leads and nurture existing ones. Pick your audience based on where they are along the buying journey and create a webinar designed to move them along to the next step. The more webinars you create, the more targeted you’ll need to be with your audiences, topics and CTAs. An important part of this is knowing what you expect users to do after watching your webinar. Not everyone’s going buy as soon as the screen dims and you’ll need to have a list of desired actions mapped out. 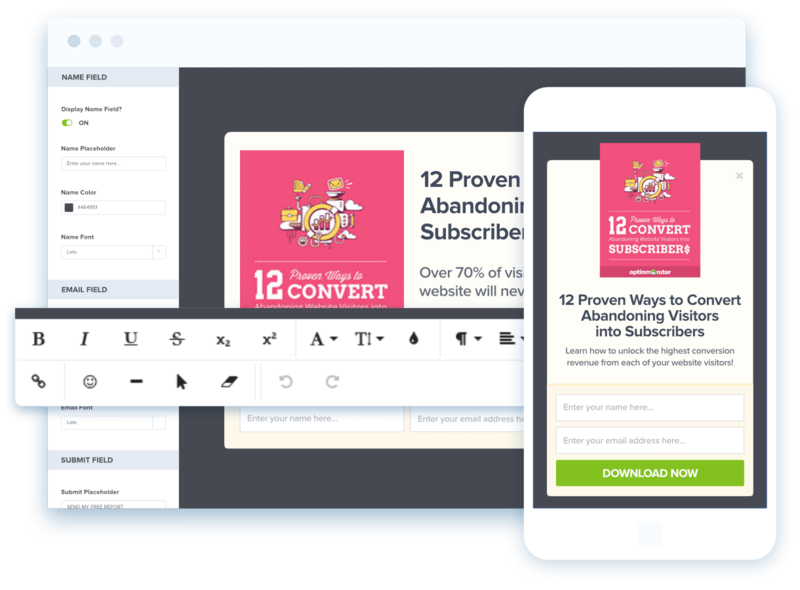 These are the basis of your CTAs and your email marketing efforts that follow. Optinmonster‘s exit-intent popups only trigger when a user looks like they’re about to leave. Another use for exit-intent popups is to have them trigger when users look like they’re about to exit your webinar. Again, there are always UX concerns with using popups but this is something you might want to test and see if it reduces your exit rates. This one is crucially important. You want to know where users first discover your webinar (search, Facebook, guest blog, etc.) and track their actions as they continue to interact with your brand. Do they sign up right away, leave and eventually sign up through one of your remarketing campaigns or take more persuading? You need to know the answer to these questions to understand how effective your webinar marketing channels are performing. Once people are done with your webinar, it’s time to push them for further action. Some may have converted while watching, others might have resisted your CTAs and some probably didn’t even make it all the way through your webinar. Which means you’ll want to target these different user types with appropriate follow-up messages. Segment your email marketing lists and tailor messages for each audience type. We talked about providing users with a transcript of your webinar earlier, which you can send to them as notes after they finish watching. You can do a lot more than this, though. Try creating infographic summaries or something a little more visual and work your CTAs into something people can use after they’ve finished with your webinar. Aside from giving you another conversion opportunity, asking for feedback helps you gauge the quality of your webinar leads. This also brings us back to a previous point about implementing feedback as a means to optimise your webinars for better performance. If people keep telling you your webinars are too long or poorly optimised for mobile, you know what to fix next. Your webinar won’t be the only piece of content you’ve published on the same topic. Reach out to attendees with links to related content that might interest them and bring them closer to one of your desired conversions. Publish blog posts or create emails that answer the questions raised in your Q&A. These are obviously topics that interest the people who attended your webinar so reach out to them with more information about their concerns. A great way to strengthen the bond between your brand and attendees is to offer them some kind of reward. Give them “free” access to some of your premium content, a discount of some kind (not a bad conversion incentive) or something that signifies VIP status. No matter how well you promote your webinar, there will be some people who sign up but don’t attend. In fact, the majority of people who sign up probably won’t attend but these no-showers are still leads that you can work with. Create a segmented email audience for these people and get working on your follow-up messages. The first message you’ll want to send people who didn’t attend your webinar is another chance to watch it. Make this sound like a bit of a gift – not something you would do for just anyone. Include highlights from the webinar, feedback quotes and other incentives to make it seem like they really missed out by not watching the first time. Sending a “last chance” message to no-showers might give the more reluctant ones the incentive they need to finally watch your webinar. Don’t be too pushy. Simply tell them their seat will expire soon and they’ll miss out on the benefits of your webinar if they don’t watch now. Some people won’t watch your webinar, no matter what you say to them. This is fine – it’s all part of the webinar marketing process. Your next step is to come up with an alternative strategy that will keep these leads involved with your brand and moving closer towards doing business with you. At this stage, you have a number of webinar audience segments: attendees, non-attendees, converters, non-converters and any other segments you consider valuable. You’ll want a follow-up content strategy in place for each of these with targeted messages that address their current place along the consumer journey. Promoting your webinar isn’t your only remarketing goal in this strategy. You can adjust your remarketing messages to promote your conversion goals, follow-up content and other offers so people continue to see them as they browse the web. You can’t nurture webinar leads without tracking the right metrics and KPIs. You’ll have to devise a specific list of these to suit your own webinar objectives – something that could change from one campaign to the next – but here’s a rundown of some essentials to get you started. The number of people who register for your webinar. This is a specific number, not a ratio or percentage. The percentage of people who register for your webinar vs the number of users who visit your landing/registration page. The ratio of people who actually attend your webinar against the number who sign up to attend. The percentage of attendees who watch your webinar in full. Don’t be too strict on how you measure this as some people might exit once they can tell your webinar is wrapping up. Does it really matter if people stick around to hear you say goodbye? If not, set your cut off point at the last important thing people really need to see in your webinar – eg: your final CTA. This tells you how many people stopped watching your webinar before reaching the end. Again, don’t be too strict on measuring this, for the same reason mentioned in the previous point. This tells you how many attendees view the CTA(s) in your webinar, even if they don’t end up watching it in full. This measures the percentage of attendees who convert during or after viewing your webinar (attribution and tracking actions are important for the latter). The percentage of attendees who complete the feedback surveys you send out after they watch your webinar. The percentage of registrants who download your webinar once it becomes available. The number of attendees who continue to watch your webinars or engage with your follow-up content. Managing an effective webinar marketing strategy requires a certain set of tools. Again, the specific tools you’ll need to get the job done will depend on what you’re trying to achieve – but here are some key considerations for you. The first choice you need to make is which kind of webinar marketing tool you’re going to use. 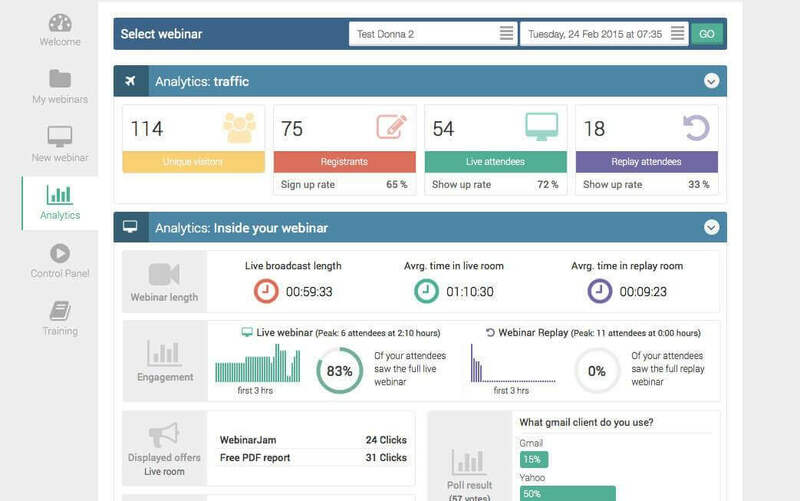 If you’re planning to automate your webinar strategy in any way, you’ll want a specialist tool like EverWebinar but there are plenty of other options for less demanding needs. Check out our comparison of the 10 best webinar marketing platforms available right now for more help on choosing the right tool for your needs. Your webinar marketing efforts will come to nothing without a good landing page builder. Some webinar platforms come with customisable registration pages but not all of them. Besides, the quality of them can vary quite a lot so you might be better off with a dedicated language page builder, depending on your other tool choices. Advertising your webinars will be important and choosing the right platforms is an essential part of the planning stage. AdWords is the obvious choice for search ads and Facebook is hard to ignore for social advertising – if not for its targeting options alone. But you also have LinkedIn, Twitter and a host of other platforms that can help you reach a different kind of audience. Convincing people to sign up for your webinar is no easy task and the last thing you want is your web forms preventing them from registering. get yourself a good form optimisation tool like Leadformly to stop your registration forms being a barrier to attending your webinars. 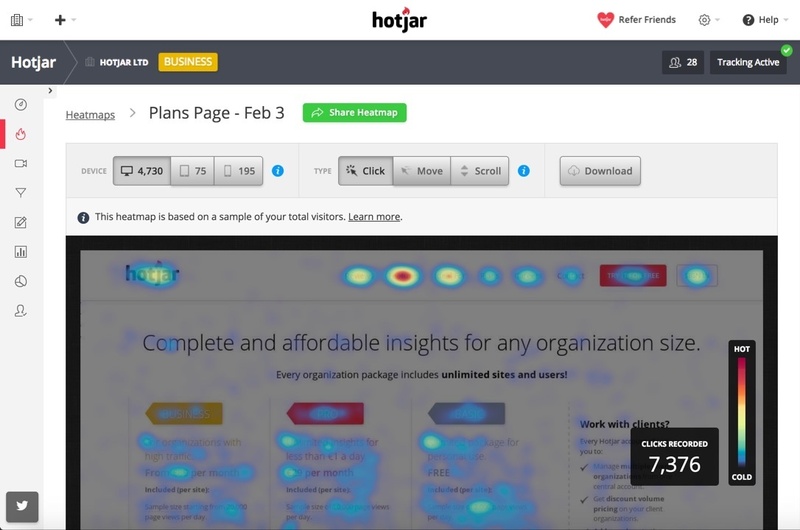 With a heatmapping tool like Hotjar at your disposal, you can track user behaviour on your landing/registration pages to see why people aren’t signing up. Is your CTA in the wrong place? Is there something preventing users from scrolling down to your signup form? Or is something distracting user attention away from the most important parts of your page? Heatmapping can help you answer these questions and increase the number of people signing up. When you’re including presentations slides in your webinar, you want to make sure they look the part. Use professional presentation software and create individual slides using design software like Adobe Illustrator. Likewise, use professional data visualisation tools for tables, graphs and other visuals. If all you need is a laptop and a mic to make things happen with your webinar strategy, that’s great. If you’re trying to create a more ambitious production, though, make sure you know what you need in terms of cameras, lights, sound gear and production software – and be willing to pay the price. As soon as you start recording webinars, using multiple cameras or mixing with sound equipment, you’re going to need an editing team. For live webinars with multiple cameras, mics and multimedia content, this is more demanding. For recorded webinars, you may only need a team of one or two. Regardless of how big your editing team is, you don’t want to scrimp on editing software. Stay away from budget tools and those cheesy fade cuts. You need to consider video and audio quality as well as compatibility with the rest of your hardware/software tools. With these tips in mind, you should be ready to put together your own webinar marketing strategy. You don’t need to follow every tip religiously; identify your own goals, KPIs and use the best tools to get the job done your way. If you’ve already got your own webinar strategy up and running, hopefully there were still some useful pointers in here for you.